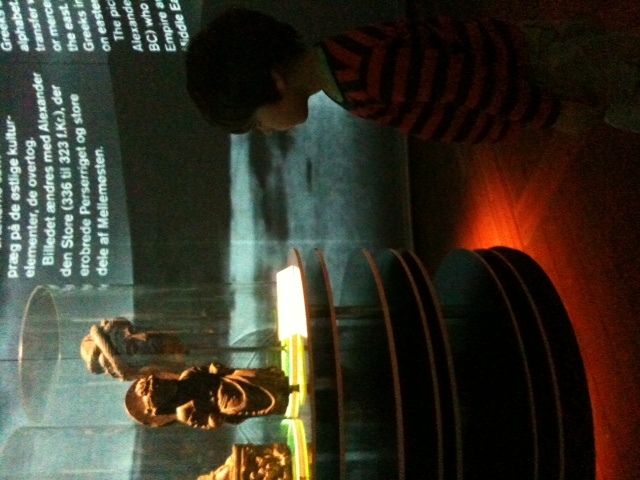 Yesterday, I took my family to visit the brand new Europe meets the World exhibition at the National Museum. Actually, we’d hoped to join the childrens workshop, and was all set for a virtual trip to Italy, Germany or another exciting destination, when we realised that this was only possible on Sundays, so we’ll have to come back for that. Finding that the exhibition, although beautifully excecuted with a combination of objects and video projections, was a bit too abstract for our 4 and 7 year old’s, we ended up opting for the excellent children’s section of the museum instead (a family favourite and perfect weekend hangout in the winter months, inspiring hours of play and perfect in combination with visits to the museum collections). As a consequence, I couldn’t give the exhibition the time and attention that it deserved, and will also have to come back for a proper visit to that (sans kids). Still, the use of QR codes was too much of a temptation for my geeky curiosity, and I couldn’t resist getting my scanner out. Unfortunately, this turned out to be an illustration of the challenges of utilizing this type of technology in an exhibition. Now, motivations and obstacles for using your mobile in the museum for streaming/downloading museum content or sharing your opinions, and how this fits into and affects the museum experience overall is a (million dollar) question in its own right, which I won’t go into at this point (but which I will definitely explore in my project). Suffice to say that as many museum visits are social in nature, one person’s desire to explore in depth may not be compatible with the shared objective of the visit, as in our case. But let’s just focus on technology for now. 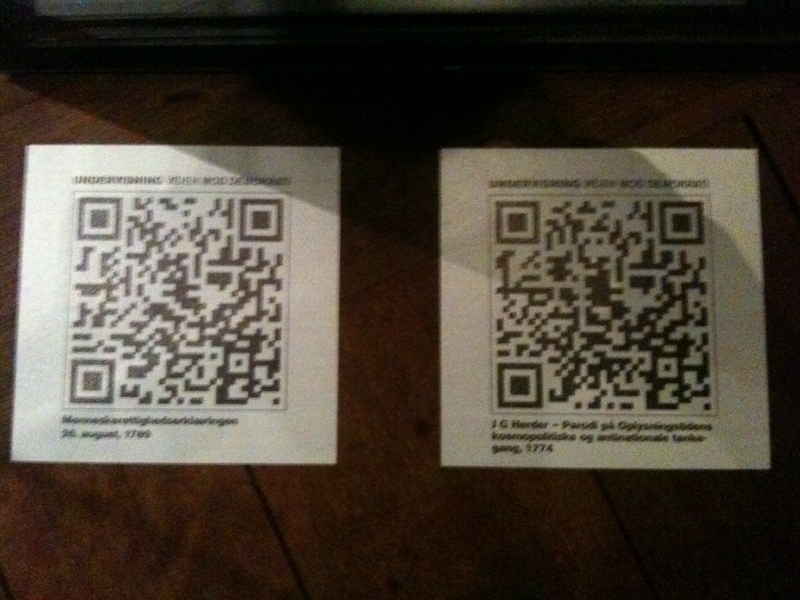 A lot has happened since I first wrote a post on QR codes back in 2009. I believe that a large part of today’s audience will now recognise and understand the use of the 2D barcodes as well as having the smartphone complete with scanner app ready for using the codes when desired, and still the novelty hasn’t quite worn off yet. In other words, time is ripe for putting this technology to good use in the museums – it’s cheap and simple to add a sticker to the exhibition display and doesn’t take a lot of technical savvy to set up the backend mobile friendly websites, allowing the museums to focus in stead on producing top quality content to augment the experience, supplementing the objects with audio, video or text, inviting participation in polls etc. Still, in the case of this exhibition, the decision to offer content via QR codes clashes with the general design and ambience of the displays, created with subdued lighting and animated projections. As Seb Chan of the Australian Powerhouse Museum points out (or is ‘pointed’ more correct, given that the post I’m referencing (again) is also from 2009) in a brilliant post on the problems with, and solutions to, using QR codes in an exhibition, the shadows you cast when leaning in to use your scanner can steal the light needed for your camera to work. Visiting on the first day of the exhibition, one of course has to allow for adjustments to come, especially when the display includes new technologies that still take a bit of getting used to. Indeed, the reception staff welcomed my comments on the light and lack of open wifi (the wifi was meant to be open access in this part of the museum, but I was continously asked for a guest login, which you can get at reception on request, I later found out). Also, as I was clearly rushing along as well as being distracted by trying to keep track of my family, my exploration of the exhibition was in no way exhaustive, I may well have missed helpful pointers or even missed the point – my objective here is not to critizise or review the exhibition as such but only to discuss the challenges of using new technologies for mediation purposes, and if this comes across as some sour remark, I deeply apologize! I only hope that next time I visit, the museum has come up with a solution for securing sufficient lighting for the codes without spoiling the ambience of the exhibition. Looking forward to exploring the themes undisturbed! 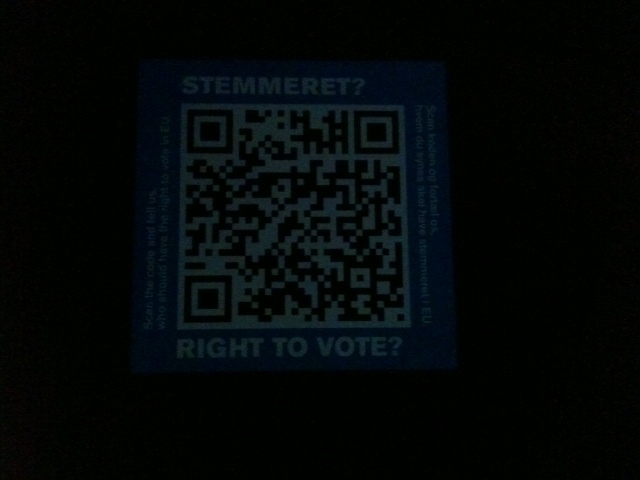 It will be interesting to learn about the uptake of these QR codes once the exhibition is evaluated. All QR labels offered a short explanation of what material you could find when scanning the code, including information on the format, i.e. video or audio. Written content, howeveer, was labeled ‘Undervisning’. In English, you would call this ‘Education’, hence previous discussions on the term mediation, but the Danish term ‘Undervisning’ has a strong classroom connotation. So much so that I was unsure if this was indeed part of some educational programme aimed at visiting school classes and not really targeted at visitors like me. If I was meant to be included in the target group, I’m not sure if the term appealed to me. I may want to learn, but am I interested in being taught? Back home, and trying to find an explanation for why these labels offered content in Danish only, I’ve come to the conclusion, that this was probably part of an educational programme. But that doesn’t change that whilst at the exhibition I believed and wished the labels to be aimed at me too. Why has ‘my target group’ not been considered as potentially attracted to these labels, and subsequently baffled or left with a feeling of being excluded? Finally, checking out the teaser video for the exhibition hosted on YouTube, it turned out to be an example of the challenges of entering into social media, as the only comment on the video was a stupid racist blurb. Wisely, the museum has simply chosen to ignore it, rather than enter into an impossible dialogue. Despite all the effort going into making the users engage and amplifying the vox pop, sometimes you wish they’d just shut up!